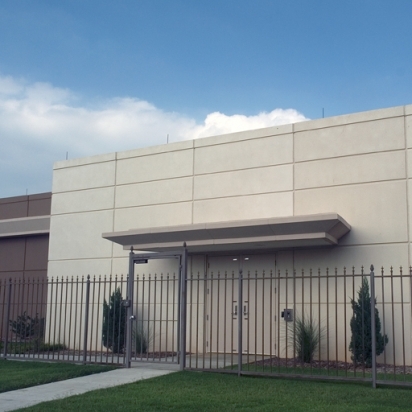 Stromberg is a premier manufacturer of GFRC cladding panels. With 30 years of experience, they use technical excellence blended with artistic talent to bring you the best in cladding panels. Choosing GFRC cladding panels by Stromberg for your next project gives you several immediate benefits. The structural load on your building will be reduced because the cladding panels are lifted from cranes and attached from inside your structure. The panels come with integral steel stud frames allowing for structure, easy attachment and a space for insulation. GFRC cladding panels by Stromberg are made in an almost unlimited selection of shapes, textures and colors. These panels weigh about 80% less than architectural precast, which means your overall construction costs will be reduced. Glass fiber reinforced concrete panels can be used on new building construction and for recladding of existing building facades. Sometimes, GFRC can even be installed over old cladding. If you’re considering renovation or restoration, GFRC cladding panels are a good solution and are thought to work well for repair and replacement of deteriorating terra cotta tiles. Stromberg cladding panels made from glass fiber reinforced concrete can be pre-fabricated in advance while your structure is being built; this will help you meet your deadlines regardless of inclement weather and other scheduling delays. The smoother installation and quality of the GFRC cladding panel means that detailing issues can be resolved prior to the pre-fabrication process. Your design freedom is increased when you use GFRC cladding panels from Stromberg. You have a variety of textures, finishes and colors to choose from. GFRC cladding panels are only ½” to 1” thick and are attached to a steel stud frame, making installation easy and quick. GFRC panel sizes range from 8 x 14 to 12 x 24, but can be made in larger sizes. Glass Fiber Reinforced Concrete is an incredibly durable material. It can stand up to hurricane force winds, its waterproof and won’t crack, rot or corrode, making it a very cost-effective choice. GFRC is a completely green product and will help your building meet LEED requirements. The experienced craftsmen at Stromberg Architectural Products guarantee to work closely with you until your GFRC cladding panel project is completed to your satisfaction. Stromberg is here to help with CAD details, design assistance and all specifications. Contact them today at 903-454-0904 for your free custom quote, and put their 30 years of experience to work for you.